The Annual Conference and Trade Show combines top-notch educational sessions with a trade show designed to enhance the learning experience. This year’s conference theme ‘FACING FORWARD’, enables us to reflect on our past as we innovate and take action to explore the future. We will reflect on our work, explore ideas, share experiences and learn from one another about how to meet the new and emerging demands safety professionals & practitioners face in an era of social media, economic challenge, systems thinking, globalization and other emerging societal trends. 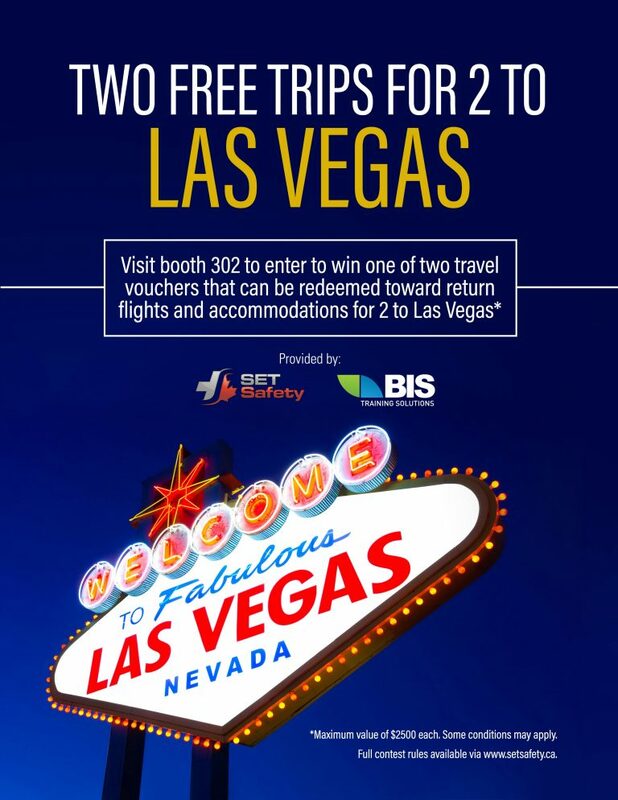 Visit us at booth 302 of the Alberta Health & Safety Conference Trade Show and enter for a chance to win one of TWO FREE TRIPS FOR 2 to LAS VEGAS. SPECIALIZED EMERGENCY TRAINING CORPORATION and BIS Training Solutions Inc. The “Travel Promotion” (the “Promotion”) is intended for Canadian residents only and is governed by Canadian, provincial, municipal law. Please do not enter the Promotion if you are not a legal resident of Canada (excluding the Province of Quebec) and are located in Canada (excluding the Province of Quebec) at time of entry. The Promotion is sponsored and administered by Specialized Emergency Training Corporation and BIS Training Solutions Inc. (the “Sponsors”). Void where prohibited by law. The Prize consists of one of two travel vouchers, or such other method of credit for travel as may be decided by the Sponsors, valued at $2,500.00 each that can be used for a trip for 2 anywhere including airfare and accommodation (the “Prize”). The Promotion commences at 9:45 AM (MST) on February 21, 2019 and will end at 6 PM (MST) on February 21, 2019 (the “Promotion Period”). The sole determinant of time for the purposes of this Promotion, including receipt of a valid entry, will be the representative operating the booth. To enter and be eligible to win the Prize a person must be, at the time of entry into the Promotion: (a) an individual legal resident of Canada (excluding the Provinces of Quebec), (b) located in Canada (excluding the Province of Quebec), (c) be of the age of majority in his/her province or territory of residence. Employees, officers, and directors (including immediate family members and members of the same household of such persons, including common law spouses) of the Sponsors, its funders, partners, and provincial representatives, affiliated companies or agents, their respective advertising or promotional agencies, prize suppliers and the independent contest organization (collectively, the “Promotion Entities”) are not eligible to enter the Promotion. For these Official Rules, “immediate family” means mother, father, sister, brother, son, daughter or spouse, including common law spouse, regardless of where they reside. Sponsors shall have the right at any time to require proof of identity and/or eligibility to participate in the Promotion. Failure to provide such proof may result in disqualification. All personal and other information requested by and supplied to the Sponsors for the purpose of the Promotion must be truthful, complete, accurate and in no way misleading. The Sponsors reserve the right, in its sole and absolute discretion to disqualify any entrant, should such an entrant at any stage supply untruthful, incomplete, inaccurate or misleading personal details and/or information. All entries must be submitted by the individual entrant and not by another person on the entrant’s behalf. NO PURCHASE IS NECESSARY. 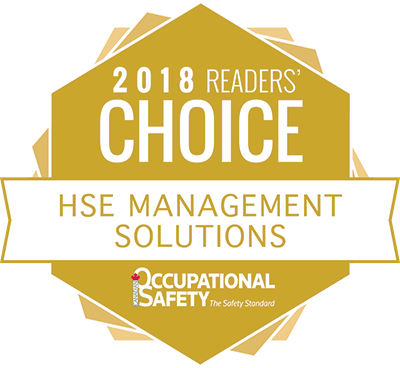 Attendance at the Alberta Health & Safety Conference Trade Show located at the Edmonton Convention Centre on February 21, 2019 during the Promotion Period, is the only requirement to be eligible to enter the Promotion. 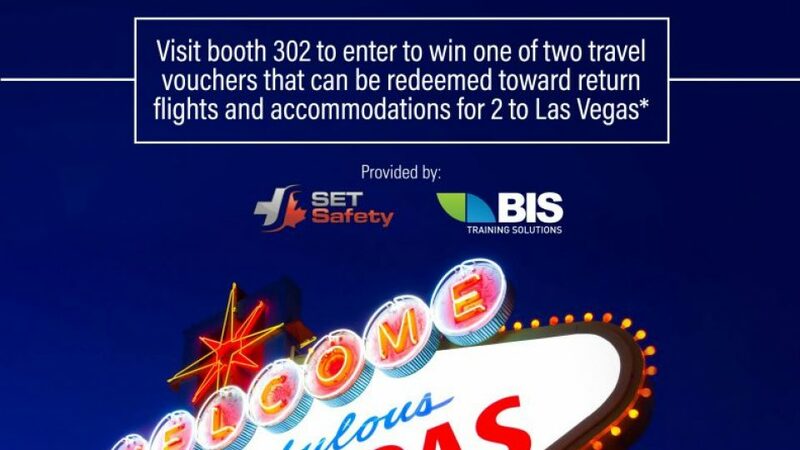 Visit the (SPECIALIZED EMERGENCY TRAINING CORPORATION and BIS Training Solutions Inc.) trade-show booth and fill out an entry form. On the ballot provided, enter your e-mail address, first and last name, job title (if applicable), telephone number, and address. Tick the box to accept as having read the terms and conditions of the Vegas Promotion.Any entry form that is submitted that is not filled out completely may be disqualified at the sole and absolute discretion of the Sponsors. The decisions of the Sponsors with respect to all aspects of this Promotion are final and binding on all entrants without right of appeal, including without limitation, any decisions regarding the eligibility/disqualification of Entries. A person or organization may only fill out one (1) entry form for the Promotion. Limit of one (1) entry, per person or organization during the Promotion Period. All information provided by participants must be truthful, complete, accurate and in no way misleading. Any person who is found to have entered the Promotion with more than one (1) entry form will be disqualified and all such entries received by such person during the Promotion Period will be disqualified at the Sponsors’ sole discretion. The Sponsors reserve the right, in their sole discretion, to disqualify any entrant who at any stage, supplies untruthful, incomplete, inaccurate, or misleading information. Proof of transmission (screenshots or captures etc.) does not constitute proof of delivery. The Sponsors will not be responsible for late, lost, illegible, falsified, damaged, misdirected, mutilated, garbled or incomplete entries, which will be void. All entries become the property of the Sponsors upon receipt and none will be returned. Entries are subject to verification and will be declared invalid if they are forged, falsified, altered, or tampered with in any way. Entries must be in “good taste” and may not be offensive or inappropriate, at the sole discretion of the Sponsors. An entry cannot defame, infringe or violate publicity or privacy rights of any person, living or deceased, or otherwise infringe upon any person’s, entity’s or organization’s personal or proprietary rights, including but not limited to, intellectual property rights. The Sponsors’ right to use the entry shall not be restricted in any way. Upon submission of an entry, each entrant grants the Sponsors the right to use, publish, adapt, assign, edit, dispose of, and/or modify such entry and the concepts embodied therein in any way, in commerce, in perpetuity, in any and all media worldwide, without limitation or approval by or compensation to the entrant. The entrant may be required to sign a release to that effect. Submission of an entry further constitutes the entrant’s consent to irrevocably assign and transfer to or waive in favour of the Sponsors any and all rights, title, interest and claim, which he/she now has or may have in the future, to the entry, and the concepts embodied therein; including without limitation, the copyright and/or moral rights therein. Such rights, title and interest shall include, but are not limited to, all intellectual property, sales, and licensing rights. The Sponsors reserve the right to reject any entry if in the sole opinion of the Sponsors acting in their absolute discretion, the entry would be inappropriate, dangerous or would violate or offend any law, regulation, order, governmental policy, public policy or third party’s rights or could potentially expose the Sponsors to lawsuits, (for example by containing any commercial content that promotes any product or service other than those of the Sponsors), embarrassment, contempt, ridicule, or adverse publicity or otherwise reflect unfavorably on the Sponsors or any of their products or services. At the end of the Promotion Period, the Sponsors will collect all legitimate submissions. The draw date is to take place on February 21, 2019 at 6:30 PM MST (the “Draw Date”) in Edmonton, Alberta. There will be a maximum of two (2) prizes available to be won (the “Prize”). Two (2) eligible entrants will be selected by random draw (a “Draw”) from among all eligible entries submitted and received during the Promotion Period in accordance with these Rules and not otherwise disqualified by the Sponsors. The odds of winning depend on the number of eligible entries submitted and received during the Promotion Period in accordance with these Rules. The Prizes consists of: The Prize consists of one of two travel vouchers, or such other method of credit for travel as may be decided by the Sponsors, valued at $2,500.00 each that can be used for a trip for 2 anywhere including airfare and accommodation. All copy, design and artwork is created by the Sponsors at their sole and absolute discretion and the winner and/or activity, community or region will have no opportunity for any copy, redesign or pre-approval. Prizes must be accepted as awarded without substitution and are not transferable and not for resale. In the event the Sponsors are unable to award the Prize or a component of the Prize as described for any reason, the Sponsors reserve the right to substitute the Prize or a component with another prize of equal or greater value, without liability. The Prize is provided “as is” without further warranty, representation, condition, or guarantee, express or implied, of any kind. The Sponsors do not make any representation nor offers any warranty, express or implied, as to the quality or fitness of the Prize awarded in connection with the Promotion. To the fullest extent permitted by applicable law, each confirmed winner understands and acknowledges that he or she may not seek reimbursement or pursue any legal or equitable remedy from the Sponsors should the Prize or any portion thereof fails to be fit for its purpose or is in any way unsatisfactory, including, but not limited to, inability to attend, cancellation by entrant or applicable airline, delay of flights, additional fees not included such as luggage fees, and any further or other component not within the control of the Sponsors. For greater certainty and the avoidance of any doubt, by accepting the Prize, the confirmed winner agrees to waive all recourse against the Sponsors if the Prize or a component thereof does not prove satisfactory, either in whole or in part. On the Draw Date, the Sponsors or their designated representative will make three (3) attempts to contact the entrants selected on the Draw Date by telephone/email (using the information provided at the time of entry) within the 48 hours immediately following the Draw. If the selected entrant cannot be contacted as indicated above; then he/she may, in the sole and absolute discretion of the Sponsors, be disqualified (and, if disqualified, will forfeit all rights to the Prize) and the Sponsors reserve the right, in its sole and absolute discretion and time permitting, to randomly select an alternate eligible entrant from among the remaining eligible entries in the applicable Draw (in which case the foregoing provisions of this section shall apply to such newly selected entrant, with the necessary amendments). BEFORE BEING DECLARED THE CONFIRMED PRIZE WINNER, the selected entrant will be required to: (a) correctly answer a mathematical skill-testing question without mechanical or other aid; and/or (b) sign and return within forty-eight (48) hours of notification of the Sponsors’ declaration and release form, which (among other things): (i) confirms eligibility and compliance with these Rules; (ii) acknowledges acceptance of the Prize (as awarded); (iii) releases the Sponsors and each of their respective officers, directors, agents, representative, successors and assigns (collectively, the “Released Parties”) from any and all liability in connection with this Promotion, his/her participation therein and/or the awarded and use/misuse of the applicable Prize or any portion thereof; (iv) agrees to have his/her photo and/or video taken with the Prize (each a “”Photo and Video”) on a date and time and at a location specified by the Sponsors (in consultation with the selected entrant); (v) agrees to the publication, reproduction and/or other use of his/her name, address, voice, statements about the Promotion and/or Photo and Video or other likeness without further notice of compensation, in any publicity, promotion or advertisement carried out by or on behalf of the Sponsors. If a selected entrant: (a) fails to correctly answer the skill-testing question; (b) fails to return the properly executed Promotion documents within the specified time; (c) cannot accept (or is unwilling to accept) the Prize (as awarded) for any reason; (d) is determined to be in violation of these Rules (all as determined by the Sponsors in their sole and absolute discretion); and/or (e) fails to verify his or her identity as the entrant to the sole satisfaction of the Sponsors, then he/she may, in the sole and absolute discretion of the Sponsors, be disqualified (and, if disqualified, will forfeit all rights to the Prize) and the Sponsors reserve the right, in its sole and absolute discretion and time permitting, to randomly select an alternate eligible entrant from among the remaining eligible entries in the applicable Draw (in which case the foregoing provisions of this section shall apply to such newly selected entrant, with the necessary amendments). The winner must complete and return by the indicated date, the Sponsors’ Declaration of Compliance and Release of Liability and Publicity Release Form (the “Form”). By completing and returning the Form, the entrant confirms compliance with the Official Rules, acknowledges acceptance of the Prize as awarded and cannot be substituted or transferred and has no cash surrender value, releases the Sponsors and the Promotion Entities, and their respective shareholders, directors, officers, employees and agents from and against all liability in connection with the Promotion and the awarding and use of the Prize, and agrees to the publication, reproduction and/or other use of his/her name, address, voice, statements about the Promotion and/or photograph or other likeness without further notice or compensation, in any publicity or advertisement carried out by or on behalf of the Sponsors in any manner whatsoever, including print, broadcast or the internet (including, but not limited to, any social media platforms and any and all media now known or hereafter devised) and consent to irrevocably assign and transfer to or waive in favour the Sponsors any and all rights, title, interest and claim, which they now have or may have in the future, to the entry and the concepts and third party elements embodied therein, including without limitation, the copyright and/or moral rights therein. Each Form must be completed and returned within the time period specified on the Form or the Prize will be forfeited and the winner will forfeit all rights to the Prize without liability to the Sponsors or the Promotion Entities. The winner may be required at the Sponsors’ sole discretion, provide a copy of photo identification showing his/her valid address. The winner agrees to co-operate in any investigations by the Sponsors to confirm his/her eligibility and to help ensure that the use of such winner information in advertising or publicity for the Promotion will not bring the Sponsors into public disrepute, contempt, scandal or ridicule or reflect unfavourably on the Promotion or the Sponsors and Promotion Entities as determined by the Sponsors in their sole discretion. By entering the Promotion, entrants (i) acknowledge compliance with these Official Rules including all eligibility requirements, and (ii) agree to be bound by the Official Rules and by the decisions of the independent contest organization, made in its sole discretion, which shall be final and binding in all matters relating to this Promotion. Entrants who have not complied with these Official Rules will be disqualified. The Sponsors and the Promotion Entities do not assume any responsibility and are not responsible for: (i) the incorrect or inaccurate capture of entry information; (ii) entries which fail to comply with the Official Rules; (iii) any loss, damage, or claims caused by the awarded prize or the Promotion itself; or (iv) any other matter whatsoever. Entry material/data that has been tampered with or altered are void. All issues and questions concerning the construction, validity, interpretation and enforceability of these Official Rules, or the rights and obligations of entrants and the Sponsors in connection with the Promotion, shall be governed by, and construed in accordance with, the laws of the Province of Alberta and construed in accordance with the Federal, Provincial, and Municipal laws applicable therein without regard to conflicts of law principles. Any attempt by a participant or any other individual to deliberately undermine the legitimate operation of the Promotion may be a violation of criminal and civil laws and should such an attempt be made, the Sponsors and or the Promotion Entities reserve the right to seek damages from any such person to the fullest extent permitted by law. The Sponsors reserve the right to terminate or suspend this Promotion or to amend the Official Rules at any time and in any way, without prior notice. Without limiting the foregoing, if, for any reason, the Promotion is not capable of running as originally planned, such as tampering, the Sponsors reserve the right to cancel the Promotion and conduct the draws from all previously eligible entries received by the date of cancellation. In the event of any discrepancy or inconsistency between the terms and conditions of these Official Rules and disclosures or other statements contained in any Promotion-related materials, including, but not limited to: The Promotion entry form, and/or point of sale, television, print or online advertising; the terms and conditions of these Official Rules shall prevail, govern and control. When you voluntarily choose to register to participate in the Promotion, personal information including, but not limited to e-mail address, first name, last name, city, province, postal code, and phone number (collectively “Registrant Information”), will be collected from you by the Sponsors. By submitting your Entry Form you are automatically entering this Promotion and consent and agree to the Sponsors’ collection and use of the Registrant Information to administer this Promotion.